Gattaca is one of my all-time favorite flicks. It is not new — it came out in 1997 — and yet it remains, I think, one of the most underrated movies ever. It was written and directed by the New Zealand born auteur Andrew Niccol, who, before and after Gattaca, has been inexplicably silent. 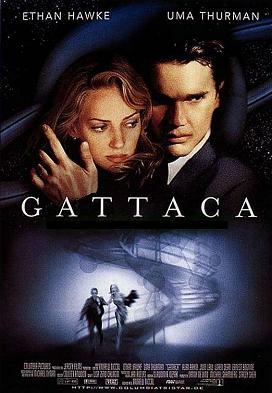 In 1997, Gattaca was nominated for an Academy Award: Best Set Decoration. Gattaca — the title of which is based on the initial letters of the four DNA nitrogenous bases (guanine, adenine, thymine, cytosine, guanine) — is set in the near future. It is a slightly cyberpunk, highly biopunk thriller that presents a vision of society driven by liberal eugenics. Vincent Freeman, played by Ethan Hawke, is an imperfect man who desires to travel to the stars. But given his genetic make-up (he’s born with congenital heart condition), society, led by an elite bureau of planners called Gattaca Corp, has deemed Vincent “unsuitable.” He has therefore been relegated to the status of “underclass,” one of those human beings useful only for menial work. And yet not disclosed in his DNA is the fact Vincent’s will is unbreakable. Thus he assumes a fraudulent identity: the identity of one Jerome Morrow. The real Jerome Morrow (played brilliantly by Jude Law) is a perfect genetic specimen who as a result of a botched suicide attempt is a paraplegic. The two of them, learning among other things how to deceive DNA sample testing, conspire to send Vincent on a space trip to one of Saturn’s moons. They succeed at passing one genetic test after another, using samples of the real Jerome’s hair, skin, blood and urine. Ultimately, a colleague of Vincent’s (A.K.A. Jerome Morrow) is killed, and so Vincent is at long last scheduled for his space mission. At which point, however, another colleague begins to suspect Vincent’s true origins, and the police investigate. Gattaca is a timeless movie — timeless, I say, because it is a profound testament to the human spirit and to that fundamental act of will which we each possess, and which each individual alone can choose to activate, or not. It is a movie that hammers home the devastating truth that we are each the shapers of our own clay. I, too, thought this movie did a great job spotlighting the horrible conditions in New York’s state correctional facilities. Ha – I remember that movie – but as I am generally down on movies these days, I will not comment on it’s quality. What is funny about this idea, is that it is nothing new. Elites have always separated themselves out from the “unwashed masses”, and come up with new ways to prove their superiority. Apparently some Russian Noblemen thought that the serfs had black bones as opposed to their white ones. Pretty obscure, Nicky, pretty obscure, but I like it. Likewise E.A. Blair with all this talk of Russian Noblemen and serfs with black bones. From the moment Vincent is born he is told he’s going to die…. Gattaca is much more than a story about the elite vs the rest of us and one mans struggle to achieve his dreams. Vincent is assured of his early death the moment of his birth. Because he is labeled with such a short time frame, no one is willing to invest in his future. From daycare to employers and even his parents, no one has faith that Vincent will live past the time given to him. He is looked at as an outcast, only capable of doing the jobs that the engineered people won’t do. The underline “concept” of the movie is deception and how things are not as they appear. False impressions sometimes drive people toward a normally unreachable goal. Much like a battle ship, the elite are not very mobile and have procedures built into orders of operation that prevent spontaneous movement and those processes can be manipulated. People who are faced with certain death are on what Sung Su refers to as “on deaths ground,” where people suddenly become capable of extraordinary things and become super human. Just like today, there is a discrepancy between geneticist’s and how perfect of a being they can create. While most individuals are engineered using similar methods, not all are equal. Only the most perfect beings are held in the highest regard. Women only seem to be concerned with your sequence score and your potential, not who you really are. Jerome Morrow should have been the best by his sequence score “quite a catch” but when he was put to the test he was only second best. The human will knows no bounds as eloquently put by Mr. Ray Harvey. This is truly a great movie and highly recommended. What an eloquent and insightful comment you leave me, Hunter. Thank you very much.